Starring: Lin Shaye, Leigh Whannell, Angus Sampson, Spencer Locke, Caitlin Gerard, Gerald Rainer, and more. Like I said, makes no sense, but whatever… With technically the second story in the timeline, we have the newest film to the series and quite frankly, I am excited to review this cause I always seem to review a terrible horror movie as my first review of each year (shout out to Rings (2017) and The Forest (2016)) So let us get to it and see if ‘Insidious: The Last Key’ lives up to my extremely low expectations. My early predictions made me think this film would be utter crap from start to finish but overall I am pleasantly surprised that it actually had elements that made me enjoy the film. I guess that is what happens when Blumhouse continues to put out horror films; something at the very least is enjoyable when it has James Wan and Jason Blum’s seal of approval. For the good, some of the scares in the film were quality scares. Sure it is standard jump scare material but there is always the typical way to do it and then there is the inventive and unexpected way which is the more rare occurrence. All too often, these films are canon fodder to make a profit and feed off its young demographic but not this film, or at least not all of the film. Obviously I will not spoil the inventive and creative scares but I simply wish to applaud the scare presentation. Also for the good, the story was very strong, in my opinion. Early on it can be seen as slow but it picks up well throughout the middle of the film which is where my interest started to increase. The film ties old and future films together well, which is something that I always admire because all too often, film series installments are sloppily intertwined. Now for the bad: As I said previously, the early going of the film is far too slow for my liking. As the formula goes, it opens up with a scare that is sure to jump those never ready for the scare but beyond that, it drags a good bit before finally getting into the meat of the story. By far the most glaring point that I found utterly obnoxious was Specs and Tucker. These two are the sidekicks to Elise Rainer and between their force-fed jokes, their disturbing actions towards other characters in the film, and their all around presence just pulled me out of the film nearly each time that they spoke. It almost seems like this film tried to replicate the horror to comedy factor that ‘It’ accomplished but it was done in all the wrong ways. I try to not let small elements of a film affect my reception of it but these guys were in far too many frames doing absolutely absurd things. That will be a no go for me. Bringing the review full circle, I initially was skeptical of how I would receive ‘Insidious: The Last Key’. I was ready to be completely disinterested with the film but by the time the credits rolled I found myself appreciative. Despite some distracting characters and unappealing moments, the story as a whole and an amount of inventive scares created a positive reception. If you are a fan of the series, it is definitely worth the watch. 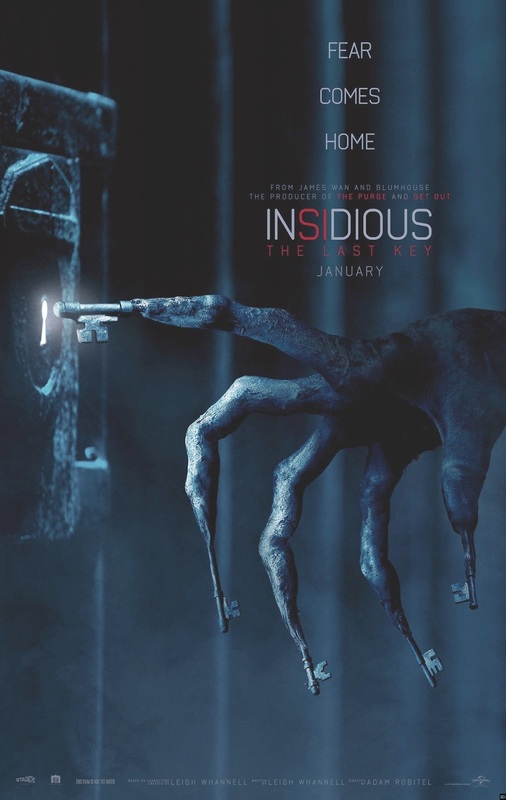 If you are simply looking for a half decent watch, I would give ‘Insidious: The Last Key’ a recommendation for choice. Posted in 2018 Movies, Movie Review.Tagged 2018 Movies, Insidious, Insidious The Last Key, Movie Reviews.